Tap into the power of anti-selling. Bake the marketing into your offer. Wouldn’t you love to tap into the strength of powerful marketing materials so you never, ever need to make a cold sales call again? If you own a solopreneurship or work for a small business or nonprofit, chances are that you don’t have a salesforce working to break down buyer resistance before closing sales. Most likely, you bear a large part of the responsibility of driving revenue by attracting customers, soliciting donations or selling products. Personally, I am not—and never will be a salesperson. To me, sales is simply gut wrenching. You will never catch me making a cold call, using highlighted or red-lined text in a marketing letter, or chatting up prospects who seem to wish they were somewhere else. It’s antithetical to my personal chemistry. Selling is difficult. Some people thrive on sales, and that’s great for them—it’s just not for me. But hey, marketing—for me that’s a breeze. So how do you win over customers without a hard sell? Although I came around to appreciating science and math later in life, I avoided these classes like the plague while in school. To fulfill the science requirement in college, I enrolled in a course designed for non-scientists entitled “Modern Physics and Anti-Physics.” The term “anti-physics” sounded intriguing, and the title has stuck with me. While I am no longer anti-physics, I remain anti-selling. When your sales process is anti-selling, your offer needs to be so irresistible that it sells itself. When your offer and your well-crafted marketing materials do all the work, or at least most of the work, all you have to do is deliver a light, soft, honest sell to close the deal. The fact is, audiences are generally wary of salespeople. The archetypical used car salesman comes to mind — the plaid suit, wide grin and calculated pressure tactics trigger a natural consumer instinct to run the other way. Even polite people have learned to hang up the phone on a telemarketer. Most people no longer have the time or desire to sit through a sales pitch unless they already are convinced they want to buy a particular product or service, often because they have a problem. Your job is to convince them ahead of time that they need what your product or service, and that your offering trumps others available on the market. You don’t have to sell. For years I’ve been telling clients who share my reluctance to sell that, when properly written, designed and implemented, their marketing materials will do 99%-100% of the selling for them. When your marketing plan is functioning correctly, calls will be inbound; no outbound cold calls required. The remaining 1% of the marketing calls are to warm prospects who come via referrals, or are otherwise predisposed to hearing your pitch. First, don’t think about the sale at all. Consider how your product or service can help others and change the world for the better. Listen to your prospective buyer’s needs and concerns, and embed your marketing strategy into the creation, packaging and delivery of your products or services. 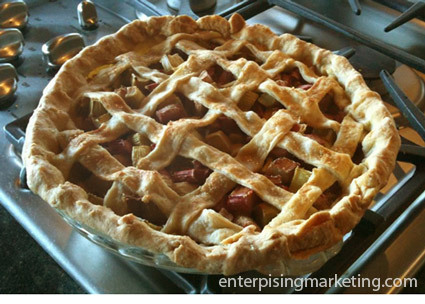 Seth Godin calls this “baking” your marketing into the product. Offer solutions with your own unique perspective, twist or passion. Apple Inc. is a perfect example. Attract prospects with marketing materials that carry a clear, concise message through a well-designed presentation. Your materials should be attractive at first glance, even from afar. They should put forth a theme and style consistent with your branding, and they should have enough content to draw in prospects, without being overwhelming. Educate your prospective customers. Focus on the end result for customers, and in the most honest and transparent way, teach prospects how they will benefit from your product or services, or perhaps by supporting your nonprofit. Tell stories and share examples, drawing on the colorful and emotional content of personal experience. Be informative. Provide step-by-step information on how to purchase your offerings and give clear instructions. Online, you want your prospect to know exactly what to type and where to click on your well-organized landing page. Offline, people need to know where you are located, your hours of operation, and how to reach you by phone. Provide a variety of contact methods so your each individual prospect can choose which option is most convenient, including social media interfaces. Load your offer with extra value. Figure out what you can comfortably add to the offer that does not greatly impact your bottom line, yet could hold tremendous perceived value to your customer. Maybe it’s a complimentary consulting session or a free sample to get them started. Perhaps it’s an app or add-on to a product, or even an invitation to a special event. Stand behind your offer. Build trust and remove a barrier to the sale by offering a 100% money-back guarantee with no questions asked. This is especially important when selling online. Rarely do people ask for their money back, and if they do, it’s a sale you never would have made anyway. The offer of a guarantee can gently push a prospect over the line to become a buyer, and it drives you to ensure what you’re offering is the best it can be. To truly embrace anti-selling, take a new look at what you are offering and how your marketing materials are constructed—make them work harder for you and assume most of the selling process. You will be amazed how marketing characteristics of generosity and clarity will convince people to buy. Then rejoice that you don’t need to make a cold call! Show of hands. Would you like some blackened shrimp? Yum. Shrimp is delicious and even the thought of blackened shrimp can stimulate the taste buds. Now what if this heapin’ helping of blackened Gulf Coast shrimp was being served up by BP? Hold on a minute — that’s a different story. But that’s precisely what flashes across the screen in BP’s new television ad on Gulf of Mexico restoration which also appears on their website. It’s a slick promotional ad to improve BP’s image and paint a happy face on the disastrous effects of the massive Deepwater Horizon oil spill that began with an explosion two years ago, on April 20, 2010. Restoration of the Gulf of Mexico has a long way to go. Phase III of the response activities — containment, countermeasures, cleanup and disposal — was only recently approved on May 9. Locals complain of strange health ailments, contamination, depleted fish stocks, and a crushed local economy. Critics say that BP is dragging its feet on cleanup and restoration. All of this creates a need for the best marketing campaign that money can buy. So why would BP promote blackened shrimp? Probably not on purpose. It’s a matter of perception. The company wants to convince visitors that “the seafood is delicious” and everything is getting back to normal along the Gulf Coast. The deck is stacked against BP. Many of us can’t purge the horrific thought of oil gushing from the sea floor, making it difficult to buy into this promotional line. For the record, the FDA recently reported that Gulf seafood is safe to eat. At the same time, the Associated Press released photos of fish with lesions, sores and other deformities which scientists point to as potential evidence of lingering effects of the oil spill. 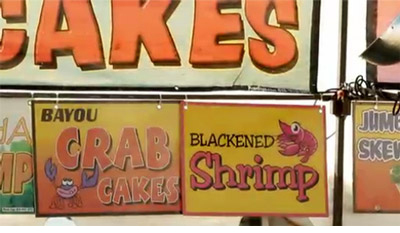 Regardless of whether or not seafood is safe to eat, the reference to blackened shrimp in an ad designed to whitewash an oil spill is a careless marketing move. Rather than encourage viewers to move on from the issue, which is the goal of the campaign, the off-message moment only reminds the viewer of the original problem. Perhaps the marketing department was not paying attention. Perhaps those producing and approving the film are so close to the issue that they do not understand the implications of pairing the dark subliminal message with images of people smacking their lips on Gulf seafood. Could there even be a chance that someone on the video production team was having a little fun and slipped this image in? The implications are damaging, and it implies that the BP ad department doesn’t understand their target audience. Do they think people have forgotten? Do they think people will not notice? Is this yet another high-handed attempt by BP to brag about how much they are doing to fix the disaster while ignoring facts that happen to get in the way? Your messaging needs to be carefully controlled. Your brand can be damaged very, very easily. Every message you release needs to be carefully considered and viewed through a number of lenses. Remember how a single mention of blackened shrimp can deep-six the effectiveness of a costly ad. Be careful what you say and how you say it because someone else might hear something completely different. Most of all, remember that the best way to generate a positive image of your brand is to back up your messaging with integrity and honesty in everything you do.